All are updated now, so some can feature their NL-OFB properties like the similar default ones. As its name says so, this is an invisible mesh-less custom fence compatible to the base game as well. No pic to show coz it's invisible! They're doubly-sided budding fences. The former two are custom contents while the latter two are default replacements that will override the corresponding game default fences. The appearance of them are no different from the default one except their bottom-ful. In the pic, the sidings are done by the 2-sided budding fences while the central ones are thin and empty in the middle when the fences are highly inclined. 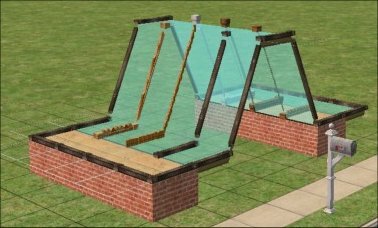 For some lot-builders, certain budding fences are essential for many build-features like aerial hanging wires, strings, cables, skylight frames, beams, etc. 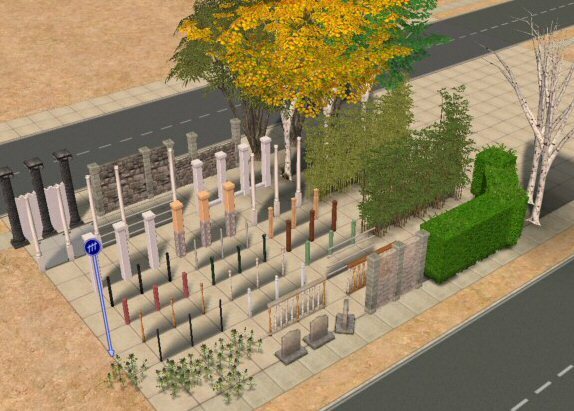 A post only version for many Maxis TS2 fences. 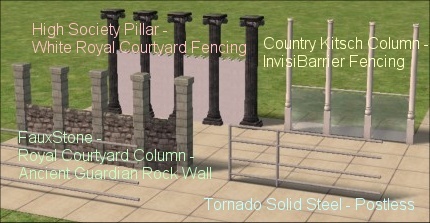 High Society Pillar column is used as the posts of the White Royal Courty Fence. As its name suggests, this fence is a mix of the stated fences. Use this tombstone fence to fence your sacred regions :D.
Ever get bored making hedge bounding? Here's another way to do it... fence your house our new hedge fence... no need to pick them up one by one since then. No maintenance needed. Leafless Birch Tree fences... not suggestable to make a lot unless you've got envious hardware supports. Bamboo tree makes good fencing, right? 1, Numenor; for his instructions and directions... so, I've learnt what I missed to alter. 4. Quaxi for the useful simpe. B3. No permission is necessary for redistribution of these textures and these recolours I made with proper instruction like this page unless stated. B4. No re-naming except me .